READING, PA - For one Fortune 100 imaging and printing equipment manufacturer, an O.S.H.A. and D.E.P. mandated toner recycling program was creating a massive production bottleneck and racking up millions of dollars in unnecessary costs. The customer recently sought an automation solution from Specialty Design & Manufacturing Co., Inc. to address the problem. The Fortune 100 manufacturer contracted Specialty Design engineers to design, build, and ship seven custom-built generic toner removal stations to their American manufacturing facility. Having achieved payback on their investment just six months after project implementation, the automation solution proved to be appropriate and cost-effective. "These special machines revolutionize the method by which the customer manages their toner recycling program," said Lee Ahrens, Engineering Director at Specialty Design. "Where they once ran a costly, labor-intensive toner disposal operation, our equipment now allows them to run a cleaner, greener and more efficient recycling operation." Prior to meeting with Ahrens and other Specialty Design engineers, the Fortune 100 manufacturer had no automation process in-place to manage their toner recycling operation. To adhere to newly passed O.S.H.A. and D.E.P. regulations, the customer employed 30-40 people per shift to process the demand of used toners being returned for re-use. Problems inherent to their existing system included spillage, high processing costs, and carpel tunnel exposure. Specialty Design's automation engineers designed a four-station, indexing turntable machine that allowed the customer to reduce the shift headcount from 30-40 employees to just one employee per machine. The machines all worked within a mandated 20 second cycle time, compared to a variable cycle time from the previous operation based on individuals' performance. 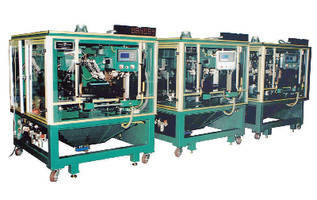 Each machine completed all hole piercing, drilling, vacuum, and toner evacuation automatically. For additional information about this project or to learn more about Specialty Design, visit www.specialtydesign.com or contact Justin Knabb at 610.779.1357. Specialty Design is a leader in the design, manufacturing, and integration of automated special machines. In addition, Specialty Design offers value engineering services, ranging from contract manufacturing opportunities, to CNC and Wire EDM machining for creating tooling, fixtures, and dies.